Script. Direction. Design. Production. Sound. Lighting. Editing. Effects. Animation. Marketing. Careers. It’s all here. With storytelling and collaboration as core principles, industry insiders Adam Leipzig (former President of National Geographic Films), and Barry Weiss (former head of animation at Sony Pictures), with Michael Goldman (prominent journalist and industry expert), guide students through the skills and the craft of video and filmmaking. With unparalleled access to the industry’s most accomplished and insightful professionals, budding filmmakers will learn techniques from the very best. This soup-to-nuts book is one students will keep, and keep using, for years. 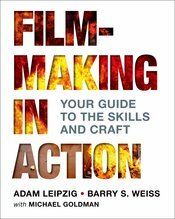 When the book is packaged with LaunchPad for Filmmaking in Action, readers gain access to exclusive "How do I?" tips videos with professionals who have worked on movies like Ant Man, Argo, Divergent, Unbroken, The LEGO Movie, Inception, Fight Club, Pineapple Express, Nebraska, The Imitation Game, Alice in Wonderland, Titanic, The Rock, Winter's Bone, Star Wars, and many more.